Saurik has pushed another update for Cydia Installer and it features several bug fixes related to the previous version. 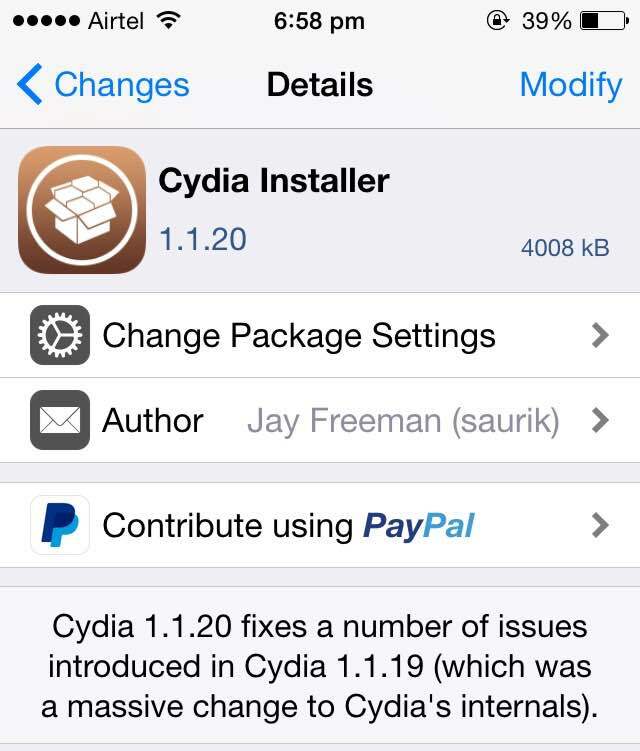 Cydia 1.1.19 was a huge update as it completely changed the way Cydia worked on a jailbroken device. Instead of running as root, Cydia now runs as mobile, which means installed tweaks will also affect Cydia. However, the previous version included certain bugs which have been addressed in Cydia 1.1.20. Cydia crashing when hiding sections under Sources tab. The Ignore Upgrades in the Change Package Settings section is now back. Cydia was able to resume installation of half-installed packages in-case something went wrong. This wasn’t working in version 1.1.19, but works in 1.1.20. In version 1.1.19, Cydia showed wrong values in Storage section. This has also been fixed in 1.1.20. That’s all the new features in Cydia 1.1.20. If you’re facing any problem with your jailbreak, please update to the latest Cydia.